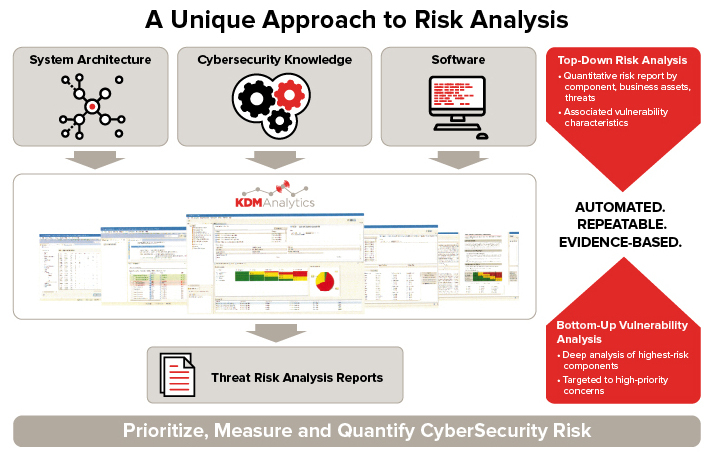 KDM’s Blade RiskManager (BRM) is a powerful cyber security risk management platform. It provides a top-down, operational view of cyber risk. BRM includes an Analysis Engine for automated cyber risk analysis and a one-stop source to store, manage, and trace all evidence regarding operational and system risk. Organizations benefit from a cyber security risk analysis solution that is proven and repeatable across a variety of systems, assets, and components. BRM effectively reduces overall lifecycle development costs and improves confidence in decision-making related to cyber risk analysis and mitigation. Understanding, assessing, and managing the risk of today’s complex cyber systems can be costly and laborious. In many instances, the process is ad hoc and unique to every system, organization, or risk assessment professional. BRM resolves this deficiency by fully automating cyber-risk analysis. It identifies multistage attacks and application vulnerabilities regardless of platforms, assets, systems, or sub-systems. BRM’s operational view lets organizations identify the most critical and risky components of a cyber system then focus security analysis and risk mitigation in those areas. The operational perspective also provides a better means of prioritizing the importance of risks and threats, and causes system based, bottom-up approaches to be more focused. This mitigates the ad hoc nature of cyber security analysis and ensures that resources are applied to the most influential areas. To ensure that threats and vulnerabilities are quantified and prioritized, BRM cyber security risk analysis minimizes human interpretations, which can be influenced by a lack of knowledge, personal bias, errors and omissions, and discretionary misconceptions. BRM’s automated analysis is empirical and mitigates errors and omissions resulting from erroneous interpretation. To enhance automation, BRM includes Blade Validate, a tool that automatically verifies the readiness of a system architecture document for analysis in Blade RiskManager. Blade Validate also allows for the analysis of non-DoDAF system architectures. Measurement and prioritization that make it easy to plan how to best leverage the cyber security risk management budget and resources for greatest impact. Where should you focus your budget and resources? KDM Analytics helps to answer the most important question of cyber risk management: Where should you focus your budget and resources?